A blueprint is a model of the application’s topology and its operations implementation. 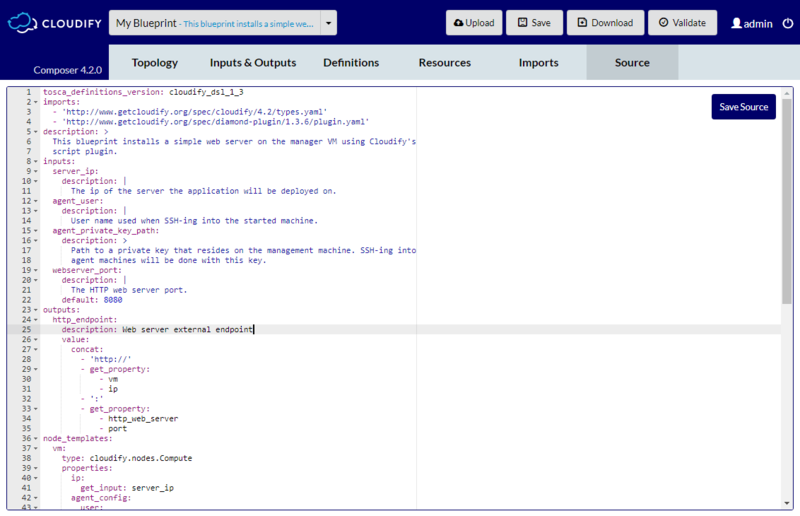 It is recommended that you watch the following video, which provides an overview of Cloudify Composer 2.3 and describes how to create blueprints. You add and move node types on the canvas using drag and drop actions. The buttons on the top right of the canvas assist you in creating and viewing the topology. Enables you to zoom in. Enables you to zoom out. Enables you to center the topology. Enables you to switch to drag canvas mode. Enables you to switch to drag to select mode. Enables you to group the nodes that you selected. 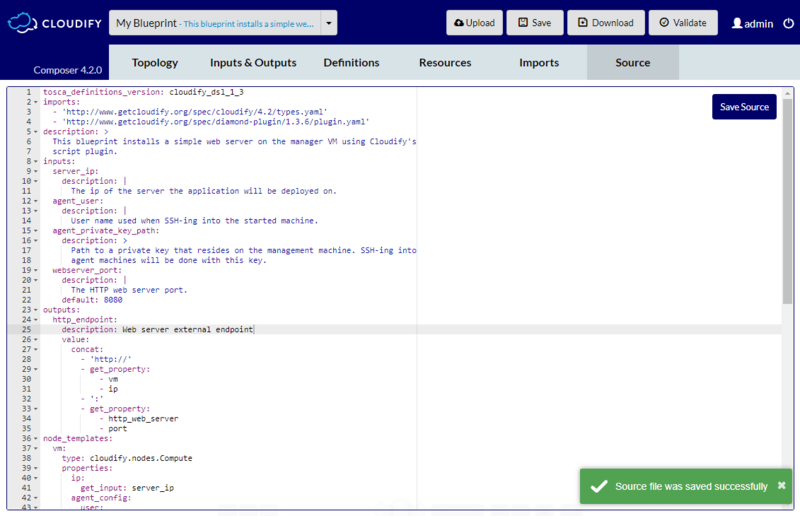 Cloudify Composer includes built-in node types, but you can also import your own. To add new node types, click Import a new node type below the stencils in the Stencils catalog. Enter the URL to a YAML file, or click Choose File to navigate to your YAML archive. The imported node type is saved in the list of imports on the Import tab, and appears in your Stencils catalog. Each type is displayed with an icon that is derived from its parent type. Select the node type that you require to add to the blueprint and drag it from the Stencil catalog to the canvas. 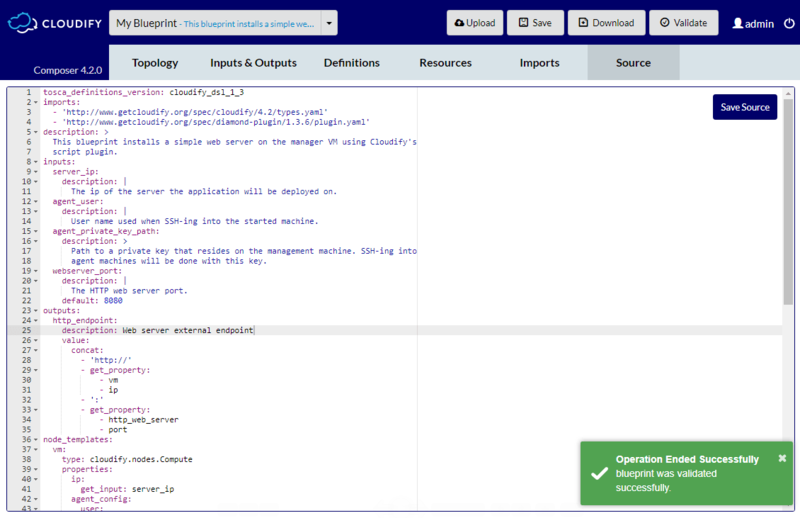 Cloudify Composer only allows you to perform valid actions. Double-click the node to display its properties. You also see properties for node-affected relationships. Clicking in the relevant properties field to make your changes. Press Enter to apply your changes. To exit without applying your changes, press Esc. Node Name - The name must be unique. Delete (button) - This operation cannot be reversed. When you delete a node that is connected to other nodes, the relationship connecting the deleted node is also deleted. Number of Instances - Unless otherwise stated, the number of set node instances is 1. Properties - The properties that you see are dependent on the node type. Interfaces - The interface properties are dependent on the node type. They enable you to specify the implementation for every stage of the node lifecycle. You can reference external plugin implementation for the interface, and also define the list of inputs. Relationships - Relationships are only displayed for nodes that are connected to other nodes. To define a relationships between nodes, where the connector icon is displayed, draw a connecting line from the edge of one node type to the edge of another. Note that the connector icons show either relationships in or relationships out of a node type. You can pull the relationship line so that it is displayed in the topology according to your preferences. Double-click a relationship to display its properties for editing and configuring the relationship parameters. To define IP components, drag the relevant icon to the topology canvas then select the node to which you want to add the IP. In the properties panel, click Network. Under the Virtual IPs section, click Add virtual IP. Select the required virtual IP from the dropdown list. The IP component is added to the node’s VNIC area. To remove a virtual IP associated with a node, select the node from which you want to remove the virtual IP. Under the Virtual IPs section, locate the virtual IP to remove. Click the X button next to its name to delete the IP. You can also delete a virtual IP from the canvas by selecting it and clicking Delete in the properties panel. It is removed from all nodes on which it was configured. To define a security group drag the relevant stencil to the topology canvas then click the node to add to the security group. Under the security groups section, click Add security group. Select the security group to add from the dropdown list. To remove a security group associated with a node, click the node from which you want to remove the security group. Under the Security Groups section, locate the security group to remove. Click on the X button next to its name to remove the group. You can also delete a security group from the canvas by selecting it and clicking Delete in the properties panel. It is removed from all nodes on which it was configured. Source tab provides a representation of the generated TOSCA code behind the application modeling. Provides a possibility to edit or paste the blueprint source code directly. Composer will parse it and reflect in the UI accordingly. To save a modified source press the button in the top right corner of the editor. If you write some illegal code, it will either not be reflected in the topology and anywhere in the Composer or will throw an error. When referring to any resources in your source code make sure you’ve added them in the Resources tab first.